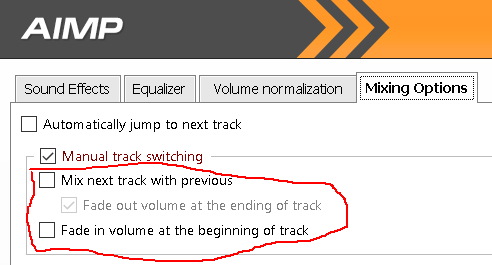 AIMP for me is almost useless for listening to the short sounds/files (like <10s) because of fading effects. Now I have to change 5 different settings in DSP Manager to start listening to some short files, then change them again to have "default" settings for music. So if we enables it and set like 10s of it, then it applies only for 10s or shorter files. I don't have it in build 2084. You responded to Soolo's picture of the mixing settings with "I don't have this in build 2084." You are correct that his pic is not the same as how the settings look in 2084, so I posted one from 2084. It may or may not have anything to do with solving your actual issue. Yep, it has little in common. I also have those settings, but I think it's not the same as Soolos's setting. So, what is this "Allow cross-mixing" option for? But it will always have to be turned on manually when needed. It doesn't allow to set the duration of the file to which the setting applies in seconds (to work automatically). Yes, this is not possible. Because this option is available in v4.60 Beta.